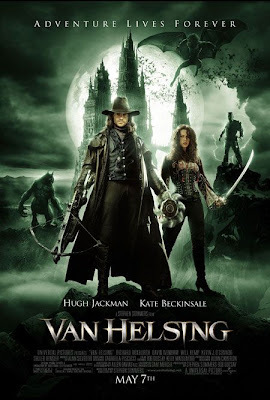 Gabriel Van Helsing (Hugh Jackman) has been ordered by the Vatican to search out and destroy Count Vladislaus Dracula (Richard Roxburgh), an assignment that doesn't make Van Helsing very happy. He is tired of killing monsters for the Church, only to be branded by the public as a murderer with a price on his head. He also wishes that he had back his memories, something that was taken away from him due to his previous sins. Cardinal Jinette (Alun Armstrong) explains that this assignment is important because, 450 years ago, a Transylvanian knight named Valerius the Elder promised God that his family would never rest nor enter heaven until they vanquished Dracula. However, Dracula still lives, but only two of Valerius' descendents -- Princess Anna (Kate Beckinsale) and Prince Velkan (Will Kemp) -- remain. The Valerius family is running out of time, and the Church is committed to saving their souls. So, armed with only a scrap of a picture, rings of garlic, holy water, a silver stake, a crucifix, an automatic crossbow, and Friar Carl (David Wenham), the Q of the Vatican, Van Helsing takes off for Transylvania. Van Helsing's arrival in Transylvania is not well met, as Transylvanians don't like strangers. As Princess Anna challenges their business there, Van Helsing notices three harpies flying towards them. They are Dracula's three brides -- Aleera (Elena Anaya), Marishka (Josie Maran), and Verona (Silvia Colloca). It's obvious that they are trying to nab Anna. In fact, they succeed in carrying her off several times, but Van Helsing manages to get her back. He finally destroys Marishka by dipping his crossbow in holy water before shooting her with a dart. Oddly, the villagers are angry with Van Helsing for killing Marishka. They explain that the vampires only kill one or two a month to satisfy their needs. Now, thanks to him, they will kill more out of revenge.